for injunctions for protection, also called restraining orders. An Injunction for Protection is a Civil Court Order (often referred to as a "restraining order" and herein referred to as "Injunction") that places restrictions on an individual (referred to as the Respondent) who has allegedly committed acts or (in some cases) made threats of violence against another individual (referred to as the Petitioner). An Injunction is requested by the Petitioner who files a "Petition" with the Court asking for protection from the Respondent. An Injunction may include provisions that: restrain the Respondent from further acts of violence; order the Respondent to leave a shared dwelling; prevent the Respondent from coming to your home, school or place of employment; and/or award temporary custody of minor children. An Injunction should not be used as a tool to manipulate the Respondent or the Judicial System, gain access to property, or to settle issues of child custody or spousal support, but rather to protect you against a genuine and well-founded fear of continued violence or abuse. Violence is defined by Florida Statute 784.046(1)(a) as "any assault, aggravated assault, battery, aggravated battery, sexual assault, sexual battery, stalking, aggravated stalking, kidnapping, false imprisonment, or any criminal offense resulting in physical injury or death, by a person against another person." Violence does not include all offensive behavior. Trespassing, criminal mischief, threats, tampering with a witness and harassing phone calls are all criminal offenses which should be reported to law enforcement, but may not necessarily, alone, qualify for the issuance of an Injunction. Filing for protection is free. There is no fee to file a Petition and the Sheriff's Office also serves (hand delivers) certified copies of the Judge's order to the Respondent without charge. A petition must be filed in the county where you currently or temporarily reside, where the Respondent resides or where the violence occurred. In Pinellas County, a Petition may be filed at one of the Pinellas County Clerk's Office locations listed at the bottom of this page, Monday through Friday between the hours of 8:30 a.m. and 4:00 p.m., excluding County holidays. To file an Emergency Petition in Pinellas County after 4:00 p.m. contact The HAVEN in Clearwater at (727) 442-4128 or C.A.S.A. 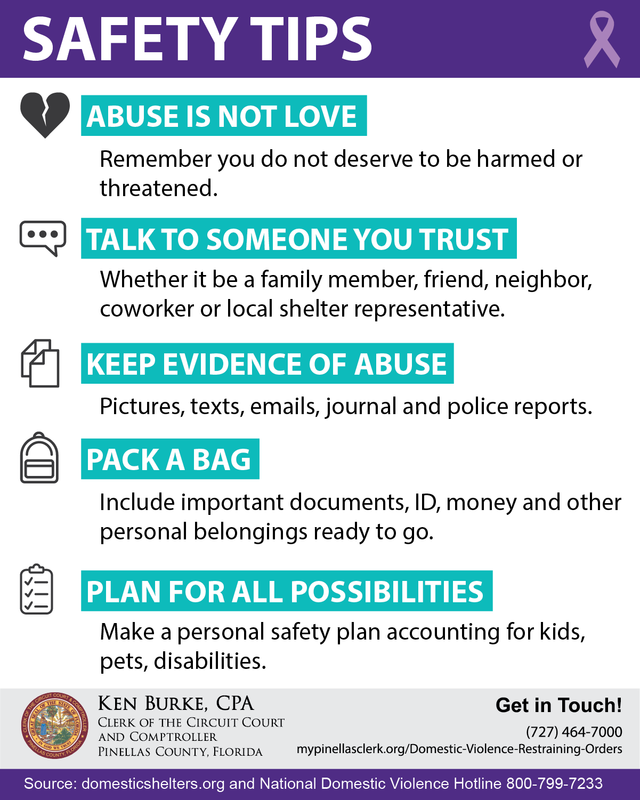 (Community Action Stops Abuse) in St. Petersburg at (727) 895-4912. Important: Because of the complexities of the forms that are required in order to seek a Restraining Order, it could take up to 45 minutes to complete all requirements. Since all paperwork must be submitted to the Court for review by 4:00 p.m., it is necessary for petitioners to submit completed paperwork to the Clerk's office no later than 3:40 p.m. to ensure same day review by the Court. Paperwork filed on business days after 4:00 p.m. will be provided to the Court for review the following day. A petition is filed by an individual against an individual. A Petition may not be filed by or against a group of individuals or an entity (such as a business). If you are a minor (under age 18) one of your parents or your legal guardian must file the Petition on your behalf. If you are filling against a minor you must provide the first and last name of the minor child against whom you are filing, as well as the first and last name of that minor's parent or legal guardian. If you do not want the respondent to know where you are living: write "Confidential" anywhere your address is requested in the Petition and related forms. You should then fill out a Petitioner's Request for Confidential Filing of Address form. This form will not be subject to public disclosure. You must provide the respondent's first and last name. Provide a brief, specific summary of any recent violence or stalking that the Respondent has committed against you. If you use general terms such as "violence" and "threats" you should include a description of the acts committed and/or words used. Copies of supporting documentation (such as police reports, other court orders, etc.) may be submitted, but are generally not necessary. Provide the respondent's location and/or as much information about the respondent as you can by completing a Sheriff's Information Sheet, so that the Sheriff's Office can serve (hand deliver) certified copies of the Judge's order and your Petition to him or her (as required by law if a hearing is scheduled). A Petition for Injunction for Protection Against Domestic/Stalking/Repeat/Sexual/Dating Violence, as well as all related or post-judgment paperwork, may be filed or additional information obtained, at any of the following locations between the hours of 8:30 a.m. and 4:00 p.m., Monday through Friday, excluding County holidays. Please Note: Injunction for Protection Forms need to be filed in person. For more information call (727) 464-7000. Determine that you need protection and put in place a Temporary Injunction. Determine that your allegations do not meet Florida Statute requirements for a Temporary Injunction to be put in place but find that a hearing is merited. Determine that your situation does not meet Florida Statute requirements for a Temporary Injunction to be put in place and that a hearing is not merited. In the first two instances, a hearing will be scheduled (within seven (7) to fifteen (15) calendar days of your Petition filing date) that you will be required to attend. The Respondent will be served (hand delivered) notice of the hearing and certified copies of both the Judge's order and your Petition. You will need to return to the Clerk's Office where you file your Petition, on the day that you file your Petition, between 4:00 p.m. and 4:30 p.m. to receive paperwork explaining the Judge's decision. If a hearing is scheduled, the Judge at the hearing will determine whether or not to grant you a Final Judgment based on testimony from you, the Respondent and any eye-witnesses. If the Judge grants you a Final Judgment, it may be in effect for an indefinite period of time or may expire on a specific date. 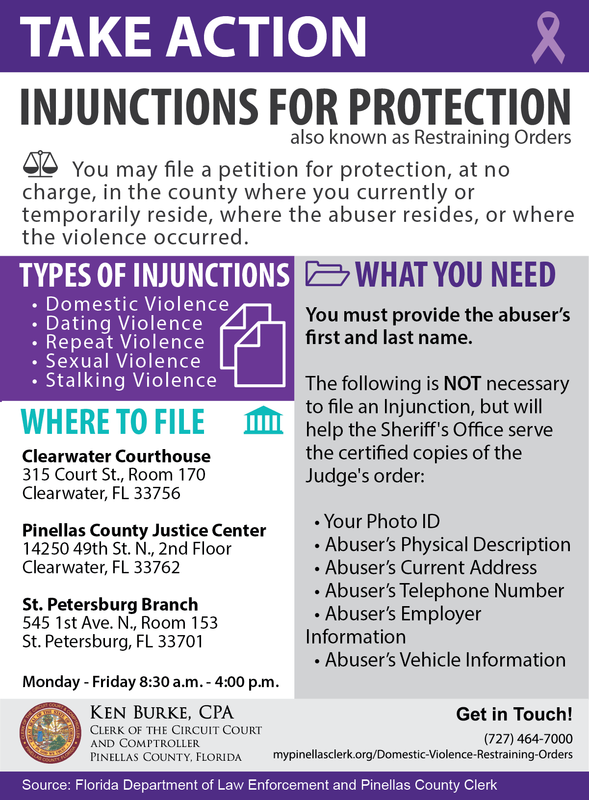 If your petition is denied but new information about additional acts of violence or stalking arises, you may ask the Judge to review your original Petition and these new acts by filing a Supplemental Affidavit in Support of Petition for Injunction for Protection (F.L. Form 12.980(g)). How long will it take me to file for an injunction? It typically takes 45 minutes to an hour to complete the petition, plus an additional 10-15 minutes for the clerk to process the paperwork. Will I need to bring anything with me to file for an injunction? A valid ID is helpful but not required. You must provide the first and last name of the respondent and bring copies of any photos, text messages, emails, etc. that you want to attach to the petition. Our office closes to the public at 4:30 p.m. but the cutoff time to get the paperwork to the judge for review and decision the same day is 4:00 p.m. We highly recommend that you come in no later than 3:00 p.m. to complete the paperwork, give the clerk time to review and process the paperwork and then get it to the judge in a timely manner. What happens after I fill out the petition for an injunction? After the clerk processes your petition, the petition is then taken to the judge for review. The judge will make his or her decision based upon your petition and written narrative of the events that have transpired. How long will it take to get an answer from the judge? You will receive a decision from the judge the same day that you file your petition. However, the decision most likely will not be made immediately and you may have to return to the office to pick up your paperwork later that day. Will the respondent receive his or her copy of the injunction today? Yes, if the injunction is granted copies are sent to the Sheriff to serve on the respondent that day. What if I need help filling out the paperwork? As Clerk’s employees, we cannot give legal advice. All we can do is help explain what the forms are asking of you. You can ask a friend or family member to assist you. Also, if you need assistance filling out the forms or you need someone to translate them, there are advocates at The Haven who can help but you must make an appointment. The outreach number is 727-441-2029. 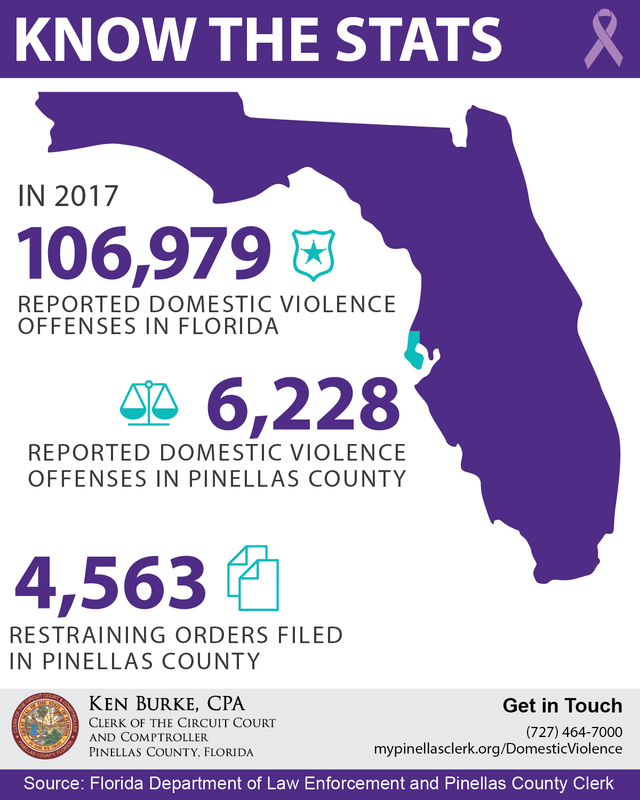 Florida law separates injunctions for protection into five categories: Domestic, Stalking, Repeat, Sexual and Dating. When determining the type of Injunction for which you need to file it is very important that you read over all of the requirements for each type before selecting one; choosing the incorrect type may cause your Petition to be denied by the Judge. Review our Injunction Filing Checklist to know which forms are needed for each injunction type. Dating Violence is violence or stalking that has occurred, or that the Petitioner has reasonable cause to believe they are in imminent danger of becoming a victim of, between individuals who (1) have been in a dating relationship within the past 6 months (2) have had an expectation of affection or sexual involvement and (3) have been involved over time and on a continuous basis, excluding individuals who have only engaged in ordinary fraternization in a business or social context. 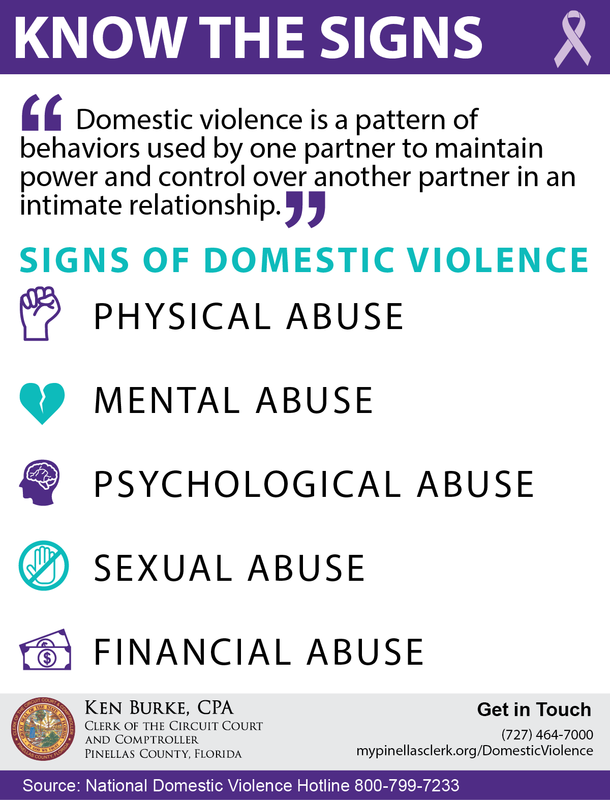 Domestic Violence is defined as violence or stalking that has occurred, or that the Petitioner has reasonable cause to believe they are in imminent danger of becoming the victim of, between individuals who are spouses, former spouses, or persons related by blood or marriage who are residing or have resided together as a family, or individuals who are residing together or have resided together as if family, or individuals who have a child in common. Repeat Violence is two acts of violence or stalking on two separate occasions, one of which must have been within the past 6 months committed by a person against another person. These types of Injunctions are usually appropriate for neighbor-against-neighbor, coworker-against-coworker, or other types of relationships that are of a non-domestic or non-dating nature. Any one of the following criteria must be met: (1) You must have reported the incident to law enforcement and be cooperating in any criminal proceedings or (2) The Respondent must have been sentenced to prison and the term expired or is due to expire within 90 days, and any one incident of the following: (1) sexual battery (2) a lewd or lascivious act, committed upon or in the presence of a person younger than 16 (3) luring or enticing a child (4) sexual performance by a child or (5) any other forcible felony wherein a sexual act is committed or attempted. Stalking Violence is defined by someone who is purposely following or harassing you repeatedly over a period of time for no legitimate purpose, causing you emotional stress. If in doing so, he/she threatens your life or threatens to harm you, with the intent to cause you reasonable fear for your safety, then the act becomes aggravated. Additional forms are available at one of the Pinellas County Clerk's Office locations, Monday through Friday between the hours of 8:30 a.m. and 4:30 p.m., excluding County holidays. You may get the forms in person when you go to file a petition, or you may print them out from this page. The Suncoast Center provides free services to sexual assault survivors, regardless of how long ago the assault occurred. 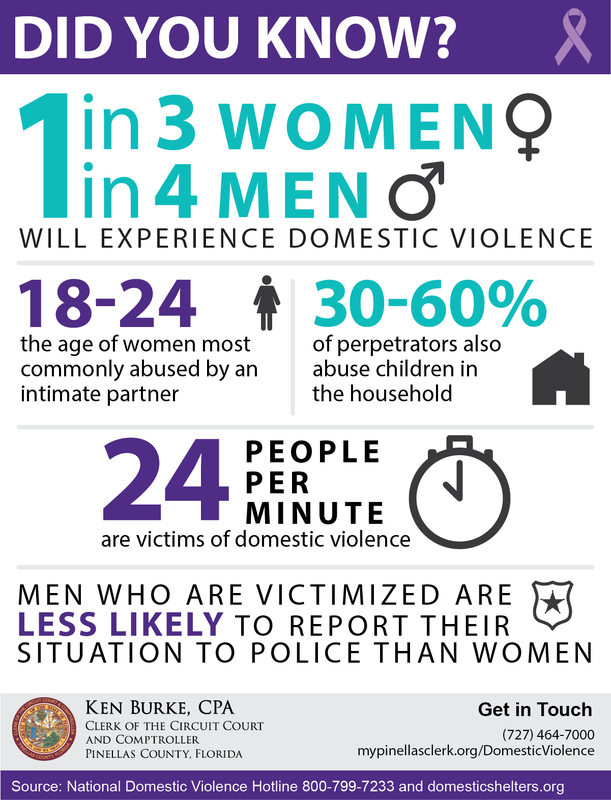 You can learn more about the services they offer at suncoastcenter.org/sexual-assault-services. 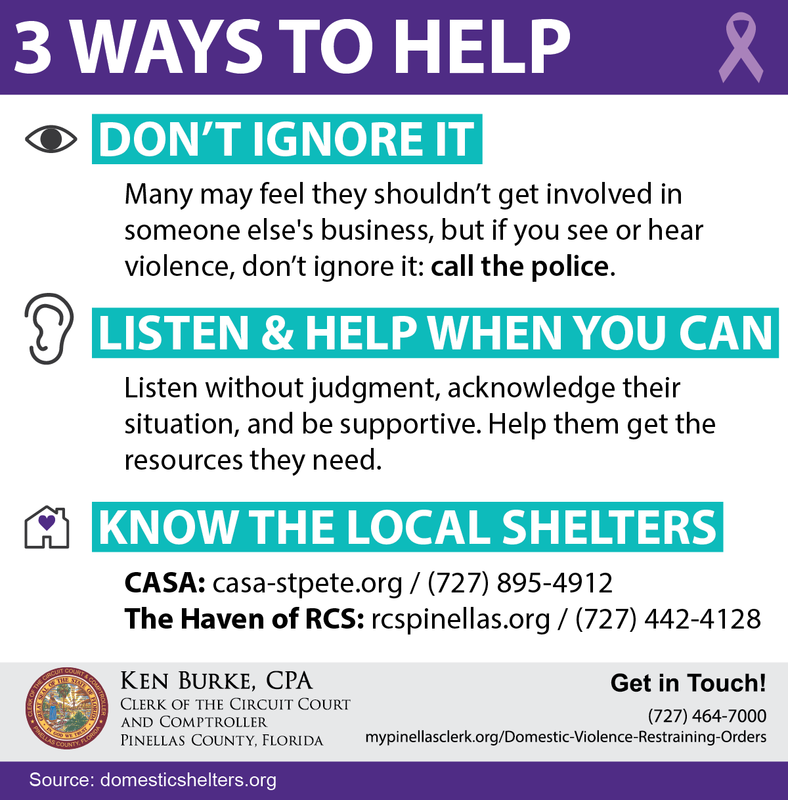 Our free Domestic Violence Safety Plan brochure (PDF) to help you better prepare for any circumstance and stay safe.